The most yummy chicken pie, with an amazingly moist filling, wrapped in crispy golden-brown phyllo! 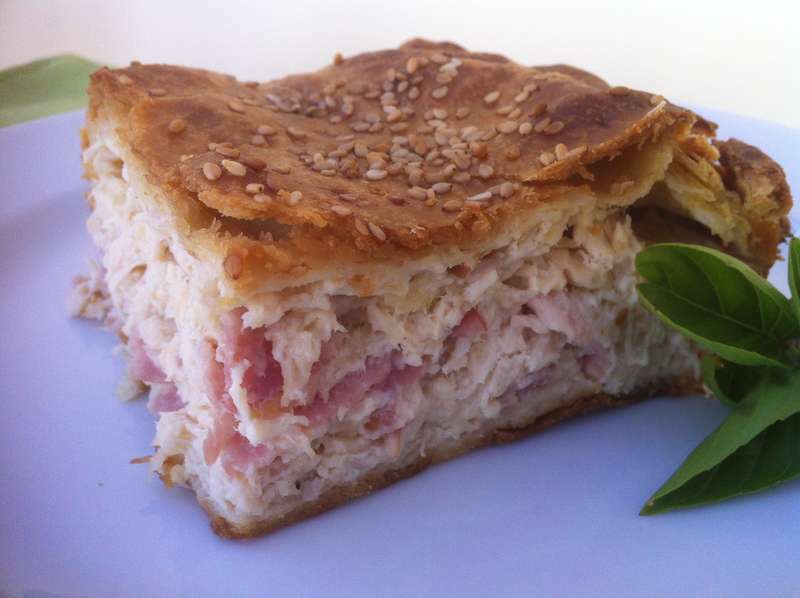 Savory pies are part of every Greek household and come into different shapes and sizes. One of our favorites is this chicken pie, as it is also a great way to use some leftover chicken and make a delicious brand new dish! Wash thoroughly the chicken and place in a deep pan. Pour in enough water to cover the chicken and add the sliced onions and a good pinch of sea salt and bring to the boil. While the chicken boils, some white foam will probably surface on the water. Remove that foam with a slotted spoon. Put the lid on and boil for about 40 minutes, until the chicken is cooked through. Remove the chicken from the pan and let it cool down for a while and keep the chicken stove aside. When it cools down, remove the skin and bones from the chicken and cut he meat into thin strips. In the meantime, prepare the bechamel sauce. For the bechamel sauce, use a large pan and melt 5 tbsps butter. Add 7 tbsps of flour to the melted butter, whisking continuously to make a paste. Add the milk, warmed, in a steady steam, whisking continuously. Pour in 1 1/2 cup of the chicken stove and continue whisking, until it slightly thickens. Remove from the heat and add the kefalotyri, the eggs, a pinch of nutmeg, salt and pepper and whisk. Add the chicken, along with the chopped ham and bacon and stir. Melt the rest of the butter. Using a pastry brush, butter the bottom and sides of a baking tray (approx. 35*25 cm) and remove the phyllo roll from the plastic sleeve. You will use 8 sheets of phyllo for the bottom of the pie. Begin by layering sheets one by one in the bottom of the tray, making sure to sprinkle each one thoroughly with the melted butter. Tip in the filling, smoothing the surface with a spatula. Fold the phyllo sheet flaps in over the chicken mixture. Add 4 sheets on top, sprinkling each sheet with melted butter. With a knife trim some of the excessive phyllo, if you like, and fold, rolling the rest on the edges. Brush the top with oil or butter and sprinkle with some water. Sprinkle with some white sesame seeds on top. Use a knife to make some holes on the top. Bake in a preheated oven at 180C for 50-60 minutes, until the phyllo is crisp and golden. Let it cool down for a while before serving.